A new power called the Red Cloud has taken over the city's underworld, and it's like nothing Superman has ever faced before. As he chases down the story, his mind is preoccupied by the absence of his wife Lois Lane and their son Jonathan--leaving the Man of Tomorrow vulnerable to the mysterious new villain of today! Even with all his power, can the Man of Steel stop what's coming for his family and his city? 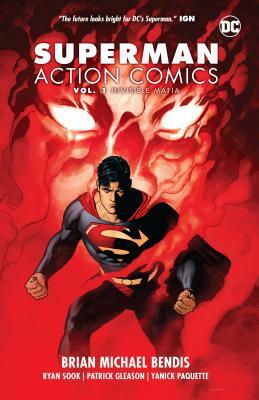 Discover the shocking answers in Superman: Action Comics Vol. 1: Invisible Mafia, as New York Times best-selling writer Brian Michael Bendis teams with acclaimed artists Ryan Sook (The Spectre), Patrick Gleason (Batman and Robin) and Yanick Paquette (Wonder Woman: Earth One) to dig deep into the city that made Superman famous--an ideal companion to Bendis' blockbuster DC debut in The Man of Steel and his ongoing work in Superman! Collects Action Comics #1001-1006--the perfect start to an all-new era of Superman!